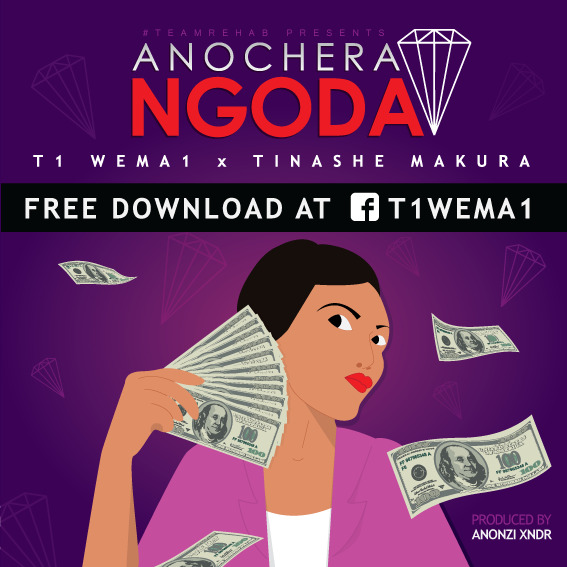 After giving us his first single Tiri Two, T1 WeMa1 returns with Anochera Ngoda, which may or not be a continuation of the story from Tiri Two. Are you thinking what I’m thinking? Anonzi Xndr maintains his production duties on this one but T1 is assisted vocally by frequent #teamREHAB collaborator Tinashe Makura (you may have heard him on MMT’s Koovha, yeah THAT guy). This is the story about the all-too-familiar gold digger, hence “kuchera ngoda”. Most brothers can relate to this as we have experienced this at one point or another. Yeah that type you would never want to introduce to your mother. If you find yourself always going off-budget because of her best believe “anochera ngoda”. From the two tracks I’ve heard from T1 so far he’s got this chilled back vibe, no trap what what, just music you can listen to on a lazy day. The different sound is a welcome refreshment from a camp known for it’s bhawa anthems. I definitely recommend this for radio, (even though it envokes wallet liposuction memories) although some may deem that this too “urban grooves” to be hip-hop. T1 WeMa1’s yet-to-be-titled debut album drops sometime next year.